Usually in modern times when States have been defeated in war they have preserved their structure, their identity, and the secrecy of their archives. – Winston Churchill, The Second World War, Vol. 1: The Gathering Storm (London: Cassell & Co., 1948), p. 232. Embarking on an analysis of North Korean political cartoons retrieved out of the dark and then gleaming fluorescent vaults of the US National Archives ought to stir a bit of reflection. These are not simply cartoons, they are captured cartoons, and their transmission into the present has come down a long and peculiar line. Such documents have been stripped from their original possessors; they are the residual booty of a momentary victory in the autumn of 1950. They may not, as Cumings wrote of photographs, “objectively hold history still,” nor prove anything at all about who started the Korean War, but very presence of the captured documents in one’s hand or their impression upon the eye itself forces the historian firmly into the ranks of the wielders of power, even as the scholar endeavours to use the image as a portal into the semi-sovereign optimism of the “North Korean Zeitgeist” during the era of liberation. To illustrate the point regarding preponderance of force, and its connection to how we come to know anything at all about North Korea during, before, or after the war, we might also look to the New York Public Library, which holds two boxes of Korean War propaganda. Much of this material consists of anti-communist United Nations leaflets, but it also includes a few folders of graphic documents wrested from Prisoners in Koje Island during the Korean War. Communist prisoners were not allowed to have writing utensils in the camps, but somehow ball-point pens were smuggled in and paper acquired, cartoons sketched of massive North Korean T-34 tanks smashing South, world maps generated and labeled with letters for educational quiz purposes, and portraits drawn of Kim Il-song on white T-shirts. When holding the documents, the historian is made aware of his or her silent collusion with, and dependence upon, the prison guards, truncheons, and tear gas, the “stock of intrinsic atrocities” that allowed the camps to function. If plunder, in this case, rests at the core of the scholarly enterprise, it is congruent with North Korea’s own perception of a continual push from without for a kind of “cultural rollback” of the gains of the revolution, however Kim-centered and atrophied those gains might be. The momentary revolt against communist power initiated by students in the northwestern city of Sinuiju in November 1945 was crushed with arms before a quarter of the city was taken over (this was no Kwangju 1980, nor Beijing 1989), so anxieties over destruction of monuments and North Korean culture become displaced fully into the war itself, and justifiably so. But even after the war, threats remained: Like the horrified Mao Zedong, North Korean leaders and diplomats surely took careful stock of the actions in East Germany in 1953 and Hungary in 1956. 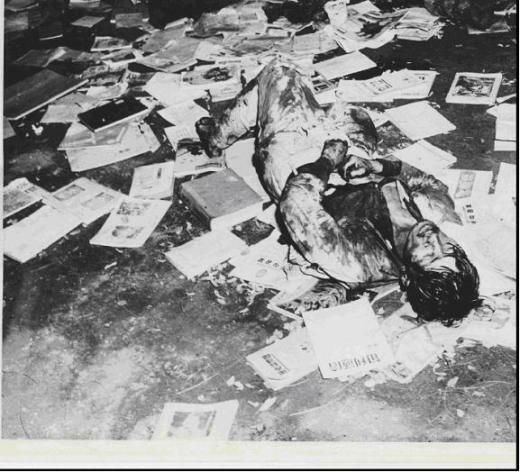 Destruction of communist icons was de rigeur in these uprisings, but so too was the burning of communist publications; this was an incendiary cultural rollback. “To destroy or to loot?” becomes the question of the rebel as well as the imperialist. The North Korean response to such pressures today is ubiquitous, and it is twofold: 1) Rebuild the archives and, in more familiar fashion, 2) Use art to attack the state’s enemies. Dae-Sook Suh, “Records Seized by U.S. Military Forces in Korea, 1921-1952,” Korean Studies 2.1 (1978): 177-182. See also Ra Jong-yil, “Governing North Korea: Some Afterthoughts on the Autumn of 1950,” Journal of Contemporary History, Vol. 40, No. 3 (Jul., 2005), pp. 521-546; Charles Armstrong, “The Destruction and Reconstruction of North Korea, 1950 – 1960,” The Asia-Pacific Journal Vol 8, Issue 51 No 2, December 20, 2010. Bruce Cumings, War and Television (Verso, 1992), 54-57. Charles Armstrong, The North Korean Revolution, 1945-1950 (Cornell, 2003); Suzy Kim, Everyday Life in North Korea, 1945-1950 (Cornell, 2013). Michel Foucault, Abnormal: Lectures at the Collège de France, 1974-1975, Valerio Marchetti and Antonella Salomoni, eds., Graham Burchell, translator (New York: Picador, 1999), p. 84; see also Michel Foucault, Surveiller et punir (Paris: Gallimard en février 1975) ; Ha Jin, War Trash (Pantheon, 2004). Dandan Zhu, “The Hungarian revolution and the origins of China’s Great Leap policies, 1956–57,” Cold War History, (2011) Volume 12, Issue 3.